TRB Teacher Recruitment Board conduct Teacher Eligibility Test TNTET For SG Asst & BT Asst Post Recruitment. After the certificate verification for the TET passed candidates TRB released the new weightage list for the TET Candidates. TET notification letter for no of Teaching post current vacancies & backlog vacancies was released on 14.7.2014. Our Tamil nadu Education Minister announced that 15,000 vacancies should be filled with in 3 weeks. 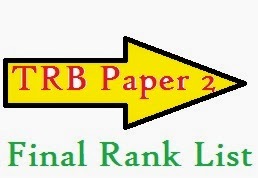 TRB also announced the TET final selection list or TET final rank list will be published on 30th July, 2014. But 30th July, 2014 Dinakaran online news paper publish the matter about that the vacancies of TET Paper 2 should be increased to 15,000 for BT posts. Also paper 1 vacancies increased to 4,224 for SG Posts. All these vacancies will be filled by the final selection list or top rank list TET candidates. We expect TET new weightage based Final rank list will be published before the August 2. Teachers Recruitment Board has issued Notification for the Direct recruitment of B.T. Assistant vide Notification No. 2/2014, dated 14.07.2014. The Board has also decided to accept the option of “willingness to join Government Service” already submitted by the candidates at the time of certificate verification of TNTET-2012, 2013, and special TNTET 2014 as application for the post of B.T Assistant in the subject concerned. Board had also conducted clarification camp from 21.07.2014 to 26.07.2014 and Certificate Verification for absentees candidates. After verification, the documents produced by the candidates in the clarification camp have been updated in the Certificate Verification data base. Based on that a final database will be arrived based on TNTET 2012, 2013 and special TNTET 2014 Paper – II Certificate Verification details. Now, the selection list is prepared department wise as per the guidelines laid down in the G.O.Ms.No. 71 School Education (TRB) department, dated 30.05.2014 and duly following the rule of reservation in vogue and the same is hereby released. The appointment order for the selected candidates satisfying all conditions will be issued by the Director of School Education / Director of Elementary Education separately after due process.